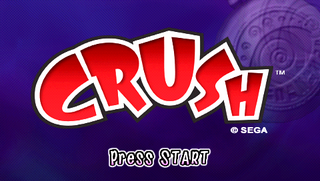 Crush is a platform/puzzle game developed by Zoë Mode and published by Sega exclusively for the PlayStation Portable. Gameplay involves switching between a 3D and 2D view of the level. Platforms which are far away on one particular axis may be "crushed" in the 2D view to be more useful. Likewise, there are sections which are only passable in the 3D view. A sequel, Crush 3D, was released for the Nintendo 3DS in 2011.